On April 2nd, 2019 the Ontario government passed Bill 66, the Restoring Ontario’s Competitiveness Act. This Bill is a sweeping piece of legislation that will negatively impact on environmental, consumer, labour and public service regulations for Ontarians. For workers the proposed changes to the Employment Standards Act, 2000 (“ESA”) and the Labour Relations Act, 1995 contained in Bill 66 weaken the protections of workers in the workplace. Bill 66 does away with the requirement for employers to display a Ministry poster providing information about the ESA in the workplace, including posters in languages other than English or French where the majority of workers speak those other languages. This means that many employees may not be aware of their rights at work when it comes to issues like personal emergency leave, overtime hours, or the minimum wage, especially if they are working in precarious or low-waged jobs, and if English or French are not their first language as is the case for many immigrant workers. Removing the requirement to display a Ministry poster outlining the ESA rights will only make it easier for employers to skirt labour laws. It will also further entrench the power imbalance between employers and precarious workers who may not know their workplace rights. Bill 66 also changes the rules around overtime and averaging hours of work. Before this new bill, employers who wished to have their workers work for more than 48 hours per week were required to seek approval from the Ministry (Director) to make such an agreement with their employees. Bill 66 proposes to eliminate that requirement. Removing government approval will embolden employers to ask their employees to enter into such agreements. The unequal power relationship between workers and employers could mean that workers, especially those in precarious jobs, will feel under pressure to enter into agreements over their hours of work. Another negative aspect of Bill 66 is that it would remove the requirement for Ministry approval for employers to enter into agreements with employees to average their hours of work in order to determine their overtime pay. The proposed changes would allow employers to average hours of work up to four weeks without seeking approval from the government. The removal of Ministry oversight will most likely result in the proliferation of overtime-averaging agreements in workplaces where there is currently no justification for them. The new rules will allow employers to more easily deny workers their overtime entitlements in a bid to cut costs. 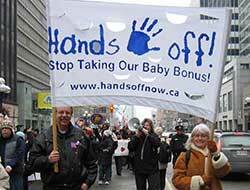 When Ontario changed the rules around overtime averaging in the 1990s it increased the sense of precarity and had a detrimental impact on workers. We should not aim to go backwards. Finally, the proposed changes to the Labour Relations Act contained in Bill 66 are also a major step backwards for labour rights in the province. Bill 66 deems municipalities, school boards, hospitals, colleges, universities and public bodies to be non-construction employers and consequently strips existing union representation of construction workers employed by those bodies. Workers employed in the construction industry will now have to certify union representation using a difficult two step union certification process. This will make it harder for these workers to unionize. But of even greater concern is the unilateral removal of union representation by the government, which sets a dangerous precedent for all workers. The rollback of regulations in Bill 66, especially its loosening of regulations around overtime averaging and hours of work will make it easier for employers to abuse the rules, and more difficult for workers to understand and enforce them. This is a step in the wrong direction for Ontario’s workers. David Bush is the Workers’ Rights Organizer at the Income Security Advocacy Centre.